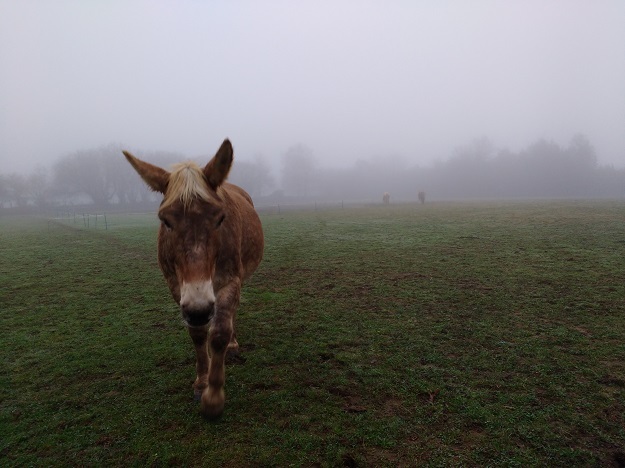 So, my good and thoughtful mules have realised that I must really enjoy spending money at this time of year, and have conspired to give themselves various maladies and malaise in order to help me spend what little cash I have left. They are very good boys, after all. First up was Xato with his conjunctivitis and blocked nasolacrimal ducts. I recently got his bill through and was somewhat surprised by the amount; let’s just say that I was charged £50 for the vet to look at him (and that’s on top of the call out charge) even before we got to any of the procedures. Once I’d cracked open a beer, I was able to laugh at the irony of his actual medication being the cheapest thing on the list. Xato coming to tell me that he has a problem (the horses kicked him off the grass) and asking if I can go and fix it for him. Then Marty’s mysterious lameness flared up again, very badly and very suddenly. To be honest, I did think that writing about it as a past event was kind of asking for trouble, but I am not a clever woman. He had been sound for four days, and then on Wednesday night he went lame again. I’d seen him only three hours previously and he’d been fine. The vet came out the next day and prescribed Danilion, which is a painkiller and anti-inflammatory, and a week of boxrest. She thought that he had probably suffered some kind of impact – like a kick – and that it was most likely a bruise, but there might also the possibility of a fracture. I do not think this is the case, but of course, it’s not something I’m going to commit to text just yet until we’re definitely in the clear. I have put a lot of work into introducing Marty to the concept of stabling, precisely in case this kind of thing ever happened, but I knew that spending a week in a stable would do more harm than good. The vet agreed and we compromised by turning Marty out in his pen during the day. Marty coped remarkably well and was sound again after about 36 hours of rest, but I kept him in just to make sure. As of today he has had his bute halved and is allowed to be turned out properly again, so we shall see how that goes. I saw him and Xato doing a lot of foolish things, but kicking is the one thing I have never seen Xato do! 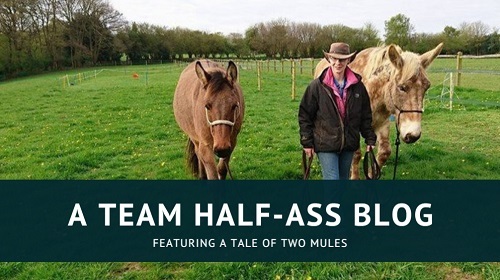 So that, combined with the fact that the two mules had quietened down a lot in the week leading up to Marty’s injury (I even saw them sharing a hay pile on several occasions! ), means that I can’t entirely lay the blame at Xato’s sizeable feet. All other expenses have at least been planned for. Xato had a visit from Gavin Scofield last week, who confirmed what I’d thought about his feet handling issues being related to a back problem. 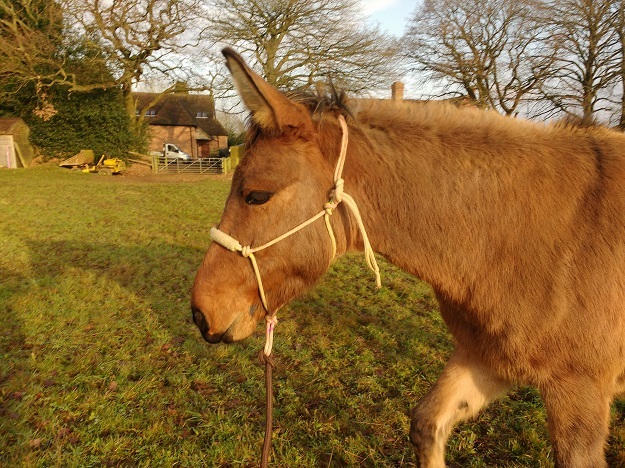 It’s nothing serious, but he has a slight weakness in his middle back which causes a tilt which in turn puts more weight on his left hind – his worst foot. I can help him by doing a few exercises with him that encourage him to lift himself up and carry himself properly, and Gavin will be back in a couple of months to do a follow-up treatment. Riding is still allowed. This week we had our dentist, Bee May, out for the herd. 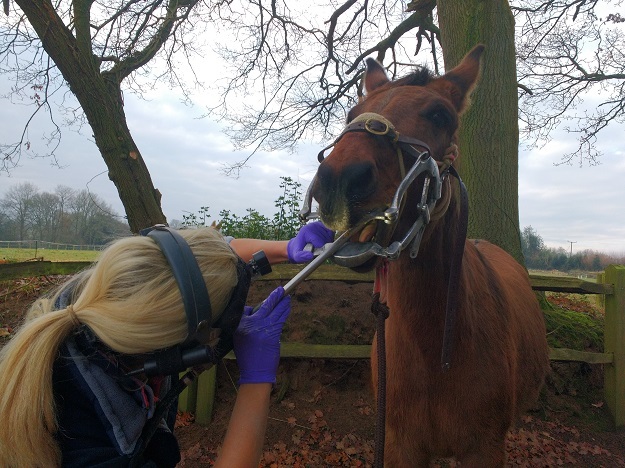 I’m pleased to say that both boys had their first full dental check-up without sedation. I was particularly proud of Marty because he was already fractious from a week of boxrest, plus he was agitated as I’d messed up his routine by leaving him in later than usual. I had to put the gag on him as he thought Bee was too scary, but once it was on the worst part was over. He still has a perfect mouth and Bee was very complimentary about him and how far he’s come! Xato was excellent, as expected. 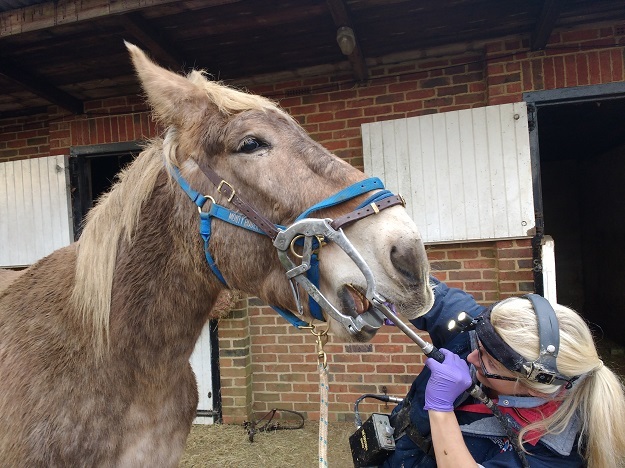 It would be easy to overlook his accomplishments because he is so amazingly easy when compared to Marty, but he had never seen the dentist without sedation before and he had never encountered power tools (sedating equines for dental work is just standard procedure in Mallorca). So having both in one session, from a dentist he’d never met before, was pretty outstanding of him! He had a couple of big hooks and an ETR that Bee sorted. Oh – and then, to top off my week of expense, my hard-drive suffered a sudden and fatal catastrophy and I lost everything on it because – as we have already established – I am not a smart woman, and I did not back my data up. I was told that I could potentially salvage my files but it would cost me a few hundred pounds. 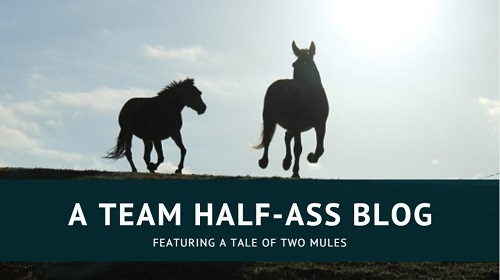 As sad as I am to have lost all my photos (not to mention the latest issue of The Mule journal, which I was literally just about to send to the printers), I think I need to save that money in case of Mules! The one saving grace is that I draft all my Mulography articles straight onto WordPress, so they are the only thing to survive as far as my writing goes. A lesson well and truly learnt.